On this day in dinosaurs, the great name is first written. For the first time in history, the dinosaurs get their name. 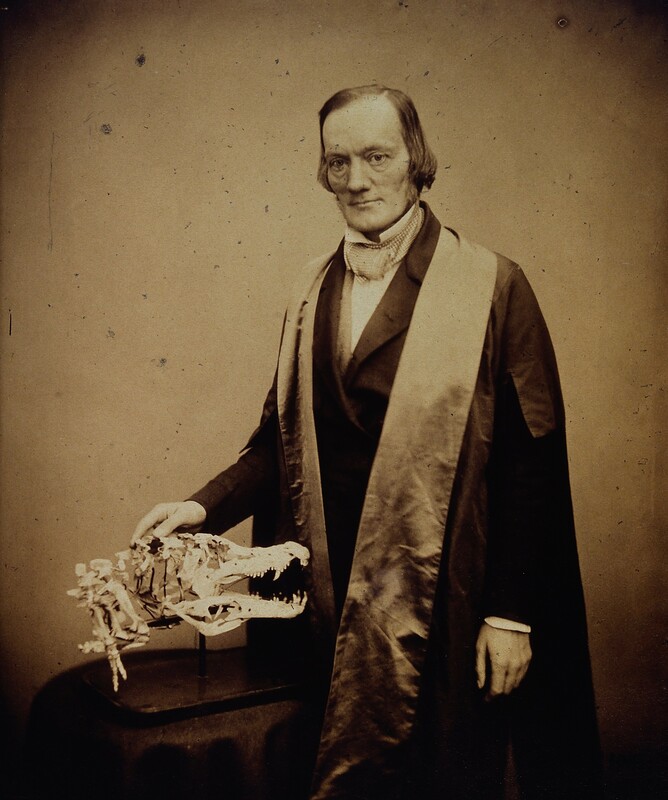 Sir Richard Owen, the brilliant and egomaniacal anatomist, coined the word ‘dinosauria’ meaning ‘fearfully great’ or ‘terrible’ lizards. On this day in 1842, 1,500 copies of Owen’s Report on British Fossil Reptiles was published. In the report, Owen first described dinosaurs as being a distinct group of extinct animals that shared anatomical characteristics. The most notable of these, according to Owen, was the fusion of the sacral vertebrae–the bones at the base of the hips and lower back. Owen noticed the fused sacral vertebrae in Iguanodon, Megalosaurus, and Hylaeosaurus–classifying the three into his new Dinosauria. The fused sacral vertebrae, Owen argued, confirmed that dinosaurs were adapted to a life on land. This adaptation helped support their immense weight. While Owen was a successful man, by any measure, his highs and lows as both a person and a scientist are all overshadowed by the contribution he made on this day in dinosaurs–giving us the most alluring, exciting, and deliciously sonorous name for our favorite Mesozoic creatures. What’s your favorite dinosaur? Share yours with us on Facebook and Twitter using the hashtag #TDIDinos.